The search for the missing becomes an increasingly desperate exercise Thursday. MONTECITO, Calif. — More than two full days after mudslides ravaged the coastal town of Montecito, the search for the missing became an increasingly desperate exercise Thursday, with growing doubts about whether anyone would be found alive. Seventeen people from ages 3 to 89 were confirmed dead, and eight others were unaccounted for. “They’re not going to find survivors anymore. They’re going to find bodies in the mud,” said David Weinert, who feared two of his neighbors were among the dead and turned out to be right in at least one case. “It’s emotional for me to say this, but I think they’re gone,” Weinert said. The air smelled of sewage and ash as more than a dozen firefighters climbed through rubble in the backyard of a mansion that had been torn apart. Some rescuers used poles to probe the muck for bodies, while others waded chest-deep in the mire. Two Labrador retrievers swam around a debris-filled swimming pool, trying to pick up any scent. “At this moment, we are still looking for live victims,” Santa Barbara fire Capt. Gary Pitney said. 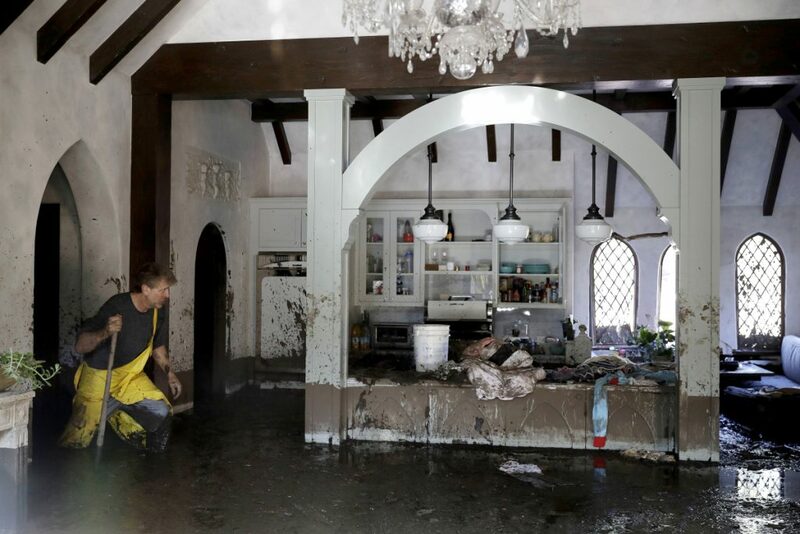 The disaster, touched off by heavy rain, took many homeowners by surprise early Tuesday, despite evacuation orders and warnings issued days in advance that mudslides were possible because recent wildfires in the hills had stripped away vegetation that normally holds soil in place. The disaster was already unfolding when Santa Barbara County officials sent out their first cellphone alert at 3:50 a.m.
County emergency manager Jeff Gater said officials decided not to send one sooner out of concern it might not be taken seriously.